The charming painting. Exquisite frame and colours…bravo! wonderful Eddie, superb compo en colors! a precariously balanced apple… about to fall off the tree? 🙂 nice shot, love the hues. 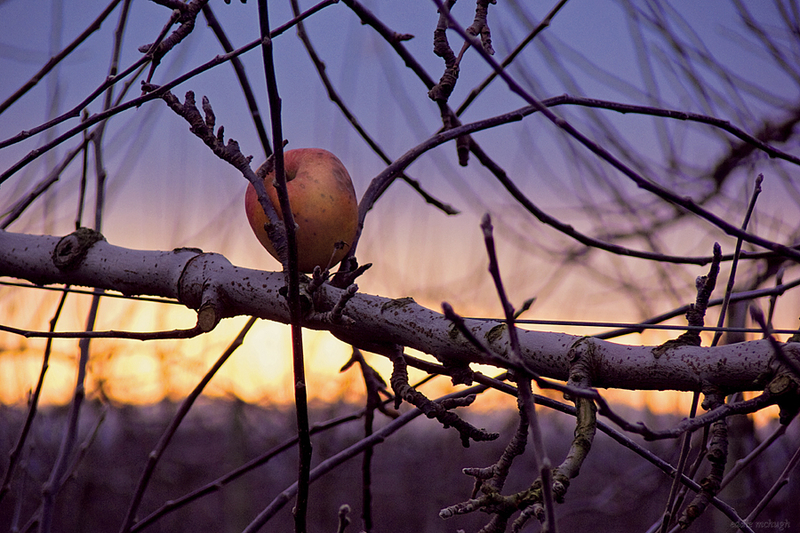 What a gorgeous photo…the apple, the branch (and tiny branch-lets…there’s a better word for those, isn’t there? ), the sun(rise? )(set) in the background…stunning colors….overall, I like it! What a nice blend of both cool and warm colors…and a nicely framed subject. Wonderful and unusual shot – great atmosphere.